The database is the hacker's "pot-of-gold," as it contains information that is very valuable to both the business and the hacker. 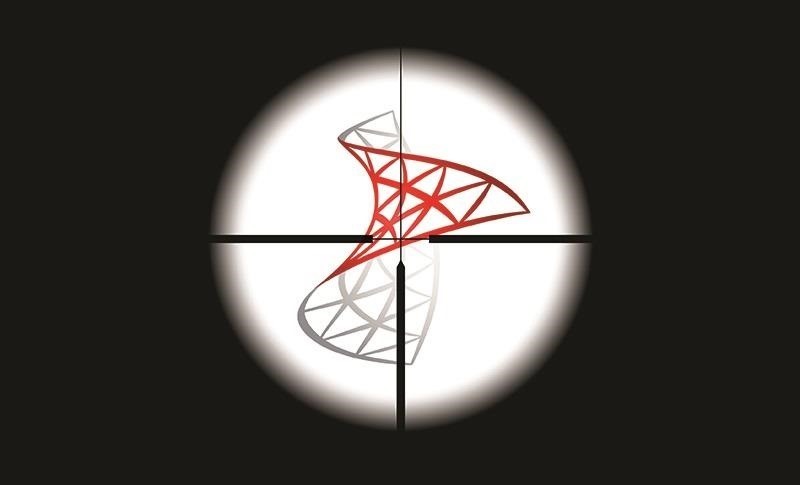 In this, the second of my series on hacking databases, we're on the "hunt" for Microsoft's SQL Server. Although far from the most commonly used database (Oracle hold's that title), Microsoft's SQL Server is very often found in small-to-medium sized businesses. Even a few big businesses use it. These businesses are most ripe for hacking as they often have little in the way of security defenses and very often no dedicated security staff, unlike Oracle databases, which are often found in the richest environments (large corporate and financial institutions) with more security. Before we can hack SQL Server, we need to able to find it. In this tutorial, I will show you some ways to find the servers that house the SQL Server database. Remember, reconnaissance is critical in hacking. We could spend hours teaching you how to hack SQL Server, but if you can't find it, well... it's all just wasted time. Nmap is an excellent scanning and reconnaissance tool, one that I've showcased before here on Null Byte in my guide on conducting active recon and DOS attacks. So, if you want to brush up, make sure to check that out. Nmap can help us find MS SQL Server instances, as well. We know that SQL Server runs on port 1433 over TCP. This port is unique to MS SQL Server as other databases use other ports. For example, MySQL uses TCP port 3306. So, we scan scan our target network for open port 1433 with an nmap version scan (-sV). Notice in the screenshot above that I've highlighted the output from nmap where it has found an open port on 1433. 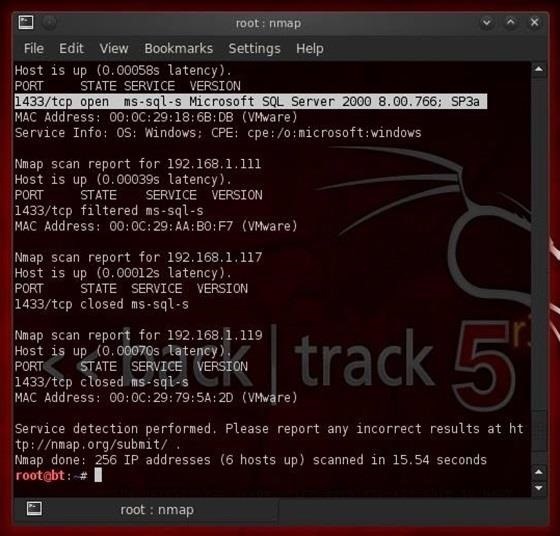 Not only does nmap find and report the port as open, but it also tells us that Microsoft's SQL Server 2000 is running on it and provides us the version and service pack. Astute network managers and security engineers will often run services over non-default ports to deter hackers. Just because a machine does not show port 1433 open does not necessarily mean that it's not running SQL Server. We know that SQL Server Browser service runs on port 1434 over UDP (this enables external users to connect to the database). Usually, if the network admin changes the default port, they will leave the Browser service on port 1434 as it's far more complex to change it. Notice here that nmap found another hidden instance of SQL Server version 10 (SQL Server 2008) running on port 6666! Since this is the newer SQL Server, it's likely that this company is storing its valuables on this server and not on the older SQL Server 2000. In fact, the SQL Server 2000 might be a honeypot meant to entrap hackers, so be careful here! 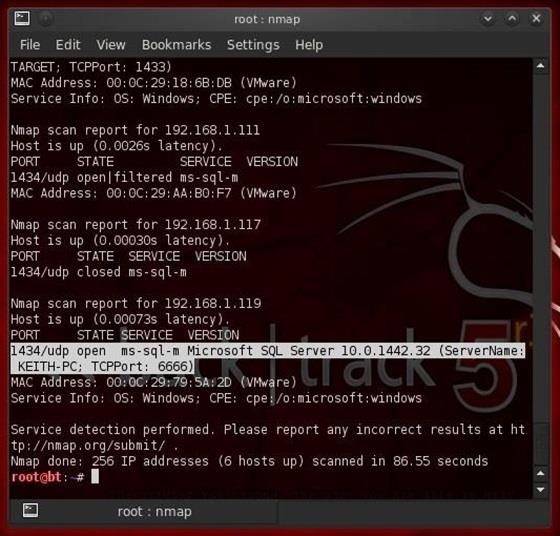 Although nmap is an excellent general purpose scanning tool, Metasploit has a tool specifically designed to find instances of MS SQL Server named msql_ping. It's found among the auxiliary modules in Metasploit. 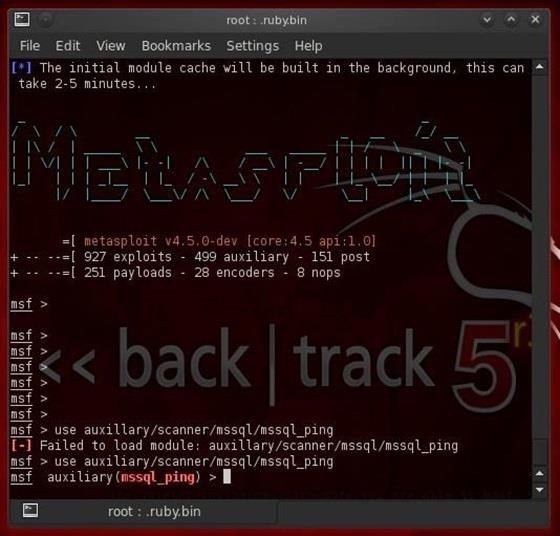 Remember, Metasploit has exploit modules, auxiliary modules, post exploitation modules, payload modules, encoder modules, and nops modules. As we can see, mssql_ping found BOTH of the MS SQL Server instances on this network that nmap found through two scans, and it also gave us detailed information on the ServerName, the InstanceName, the version number, and what TCP port the database service is running on. With the version information in hand, we can then identify vulnerabilities and other flaws in the database software. Among other places, we can go to the SecurityFocus database to search for vulnerabilities and exploits of these database instances. Now that we know what machines house the MS SQL Server instances, we can move on to actually hacking those databases, so keep coming back as we go after that pot of gold! So do these "honeypots" or decoy mssql servers serve the same purpose for when we like create an evil twin? Like, what would happen if we were to fall into the "trap" so to speak and attack the decoy mssql? Would they be able to identify who the attacker was? The honeypots are set up to entrap hackers. If you attack the decoy, they are set up to capture your IP address and watch your techniques for a signature. Basically, you are best to stay far away from these honeypots. When people work at Information Security, they will want to know WHAT can attackers do AFTER they found the server. Finding open ports is EASY; the NEXT step is what security professionals should know: WHAT are the precautions to take for the case when hackers already FOUND your open port? Because every Database server has users with permissions, so.... It's like knowing WHERE is a locked door. Yeah, but WHAT can you do after you know where it is? One step at a time. I am doing a series on hacking databases and this is the second installment. I have to differ with you on your analogy. At this point, we are only trying to find whether the house even exists! Now that we know the house exists and its address, we will progress to finding our way in the house. Are you doing this on your own network? because if you are then what is the point if you already have to be connected to the network to see if it is running the sql server? This can be done on any network. I did it on my own only for demo purposes. I understand that but this is assuming you are connected to the network. is there a way to do it if you aren't? Not necessarily. Very often the SQL server in on the web server or other public facing machine. Then you find it without being inside the lan. Otherwise, you can compromise one machine on the network and use this technique to find the sql server. 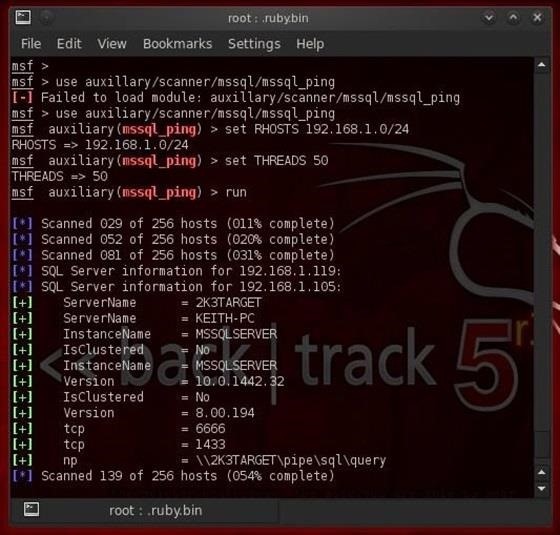 Hi sry for my ignorance but when i try "use auxiliary/scanner/mssql/mssqlping" on kali linux i receive a saying "Failed to load module:auxiliary/scanner/mssql/mssqlping"
this is a backtrack tutorial is any tutorial explaining how the metasploit system works on kali like where are the folders of the modules and stuff. Thanks for this kind article. I want to hack the home pages of my own domains for learning. any one please help. I am a web developer and I want to secure more and more for my customers. I ran the msfconsole execution to find databases, it says its complete but doesnt show me the ports or hosts or anything, just says its "complete" how can I display this? Whening using Metasploit's, "mssqlping" tool, can you set the RHOST to a public IP address. When doing the previous steps, I changed the commant to " nmap -sV -Su -v -a <public ip address>" and uncovered a SQL server on port 1434. 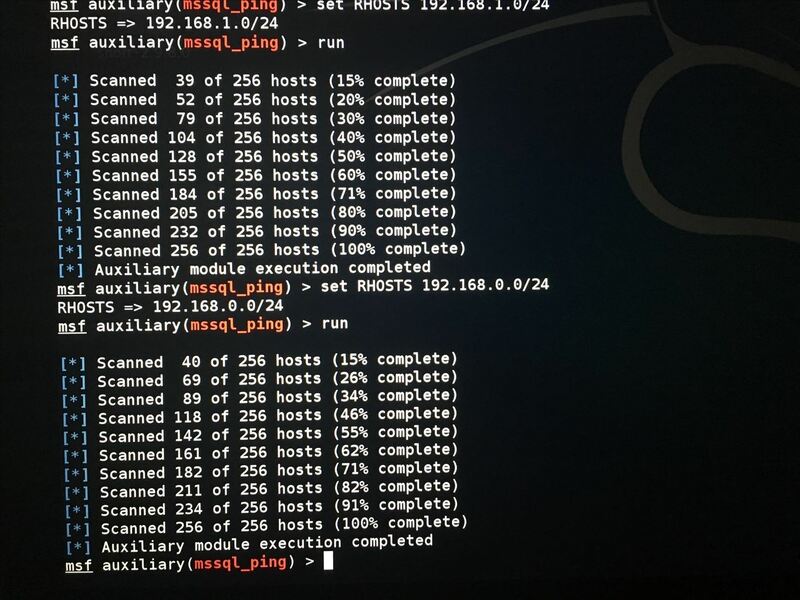 So my question is, can I use Metasploit's, "mssqlping" tool to scan a public IP address, since I am not on the network and unable to set the "RHOST" to a private IP? When I set RHOST as the public IP, and run it, I get the following feedback; "Scanned 1 of 1 hosts (100% complete)"
Is this happening becausing I'm scanning the single outside pointing interface of the router at that location? Is there a way I can use mssqlping on a website to gather info about their SQL server? I can't find any useful ms database by this way...Why? You are scanning your local network. Are there any MS SQL databases on your local network? No...So how can scan the WAN to find ms databases?